"I don't subscribe to the modern day transient attitude towards relationships." How dating has changed. 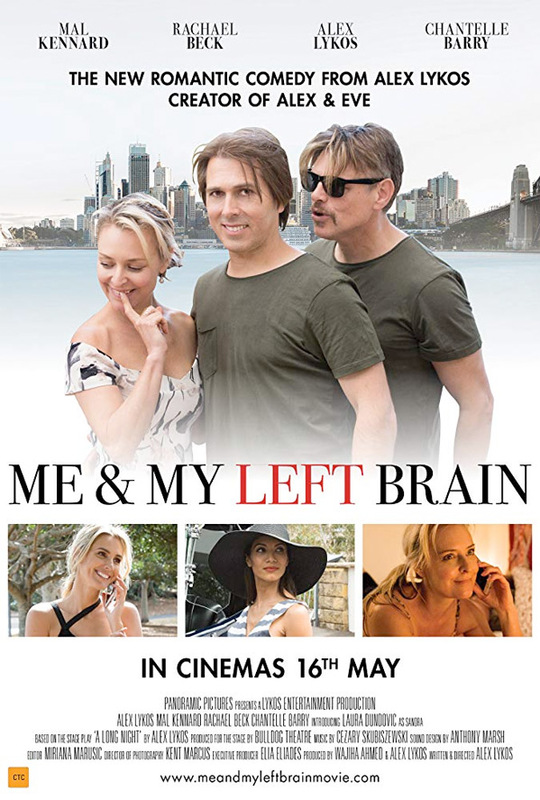 Panoramic Pictures has debuted an official trailer for an indie romantic comedy from Australia titled Me & My Left Brain, the second feature film made by filmmaker Alex Lykos (creator of Alex & Eve previously). Described as a "Woody Allen style rom-com", the film imagines the "inner critic" (the "left brain" hence the title) of a middle aged man as another man who constantly confronts him in his daily life. Alex Lykos stars as Arthur, and Malcolm Kennard plays his left brain, with a cast including Chantelle Barry, Natalia Ladyko, Rachael Beck, Simon McLachlan, and Laura Dundovic. This looks somewhat amusing, with a few funny lines, worth a look if you're interested. With an all-jazz score by Cezary Skubiszewski. Have fun. What happens when you are in love with someone, you don't know how they feel about you, you have a job interview in the morning…and you cannot sleep? The conventional romantic-comedy is flipped on its head with the comical physical representation of Arthur’s inner-critic in what is the first ever Australian film with an all-jazz score by award-winning composer Cezary Skubiszewski (Red Dog, The Sapphires, Two Hands). Me & My Left Brain is both written and directed by Australian indie filmmaker Alex Lykos, making his second film after Alex & Eve previously. This hasn't premiered at any film festivals or elsewhere. Panoramic Pics will release Lykos' Me & My Left Brain in Australian cinemas starting May 16th coming up. No other international releases have been confirmed. For more info, visit the film's official website. Anyone?